Liberals and conservatives don’t agree on much. In addition to politics, the two groups also disagree in many other areas, such as rural vs. urban, diversity, religion, family, education, recreation, arts and culture, guns, and cable news, reports the Pew Research Center, with a nod to Bill Bishop of the Daily Yonder, who tipped us off to this report. 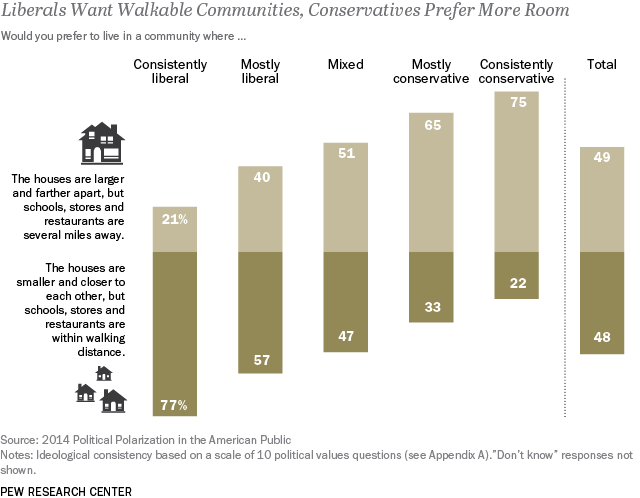 While both groups said living near family is important, liberals were more likely to say they prefer living in an urban area, while conservatives picked rural areas. Of consistently conservative respondents, 76 percent said they prefer a rural area or small town, compared to only 31 percent of consistently liberal responders who said they prefer a rural area or small town. Also, 50 percent of conservatives and 35 percent of liberals said it’s important to live in an area where people share their political views. Overall, 76 percent of consistently liberal respondents said living in a place with people from different ethnic and racial backgrounds is important, while only 20 percent of consistently conservative respondents felt that way. Also, 57 percent of consistently conservative people said living near those who share the same religious beliefs is important, while only 17 percent of consistently liberal placed the same importance on the issue. When it comes to politics, 30 percent of conservatives said they would be unhappy to welcome a Democrat into the family, while 23 percent of liberals said the same about a Republican. There’s a lot more data to comb through over here. My first reaction to this was ‘duh!’,but Pew did us all a favor by documenting this. I’ve lived in DC for most of my adult life, Manhattan for 2 years and grew up in Louisville and am here again. Sure they are conservatives in big cities, but the sociological differences boil down to: Liberals – ‘lets all work together to make living together easier’. Conservatives – ‘get off of my land!’: – Of course this is an extreme generalization, but my experience from attending public zoning hearings in DC were typically that people that I knew to be conservative more often wanted to build a barrier to their property, high fence, garden wall, and would oppose public space amenities that would draw people, etc. while people who I knew to be liberal would work to eliminate barriers. It is my opinion that we work better as a society when we all work together, helping each other. Perhaps that was Pew’s attempt at this study in that you have to identify an issue before you can solve it. I apologize in advance to any of my conservative friends if you think this was a jab. That is not what was intended.